Notre Dame plays the North Carolina Tar Heels in a Sunday afternoon game in Chapel Hill. UNC is coming off an 81- 69 win at Virginia Tech to improve to 2 and 4 in the ACC (10th in the conference) and 11 and 9 overall. Three of the Tar Heels’ four conference losses are to nationally ranked teams— by 7 at # 4 Louisville, by 1 to # 22 Florida State, and by 13 at #13 Syracuse. Miami, currently 4th in ACC standings, handed an eight-point loss to UNC in Coral Gables. North Carolina averages 75.9 points per game. The Heels make 42.7% of their field goal attempts including 33.3% from three and average 8.3 made threes per game. They average 13.6 made free throws per game and shoot 76.2% from the line. UNC averages 15.7 assists and 14.8 turnovers per game for an assist to turnover ratio of 1.1. Their rebounding average of 38.9 is slightly below their opponents’ 39.1. For the season, Tar Heel opponents average 68.8 points per game. They commit an average of 15.9 turnovers per game. UNC’s starting five are all double-figure scorers and each average over 30 minutes per game with three averaging over 34 minutes per contest. The Tar Heel’s leading scorer and rebounder is 6’4” sophomore center Janelle Bailey, who averages 16.5 points and 8.9 rebounds per game. She makes 48.4% of her field goal attempts and 76.3% of her free throws. She scored 21 points and grabbed 14 rebounds against the Hokies in UNC’s last outing. Bailey averages 31.1 minutes per game. Stephanie Watts, a 5’11” redshirt junior guard, adds 15.7 points and 5.4 rebounds per game. Watts takes 37% of the team’s three-point attempts and makes an average of just over 3 per game. She makes 37.2% of her three-point attempts. Over 60% of her shots from the field are from beyond the arc. She averages 34.6 minutes per game. Paris Kea contributes 14.7 points and 30.7 minutes per game. The 5’9” redshirt senior guard scored 26 points against Virginia Tech. The Tar Heels’ assist leader is 5’9” junior guard Shayla Bennett. She averages 4.3 assists per game and sports an assist to turnover ratio of 1.4. She plays 34.3 minutes per game and averages 10.7 points. Taylor Koenen, a 6’2” junior forward, adds 10.2 points and 7.1 rebounds per game. She is on the floor for 34.7 minutes per game and hits 86% of her free throws. Three other players average between 11.1 and 13.6 minutes per game. Jocelyn Jones, a 6’ redshirt sophomore, scores 3.9 points per game. She’s started five games and shoots 52.5% from the field. Leah Church, a 5’8” sophomore guard, averages 3.3 points, and Jaelyn Murray, a 6’2” sophomore forward, has earned one start. She averages 2.4 points per game. In last year’s game at Notre Dame, the Irish jumped out to a fast start and led UNC by 30 points — 51 to 21 at half-time — on the way to a 94 to 62 win. Marina Mabrey (25) and Arike Ogunbowale (24) combined for 49 points. Bailey had 11 points and 10 rebounds for North Carolina and Koenen scored 8 points to go with 10 boards. Kea scored 13. Sunday’s game is scheduled for a 2pm (eastern) tip-off. The game will be streamed on ACCN via the ESPN app. In-game updates will be posted below. Irish Notes: Jess Shepard may top the 2,000 point mark for her career in Sunday’s game. She currently has 1,988 points — just 12 short. Jackie Young’s 16 points, 12 rebound and 10 assist effort was just the seventh triple-double recorded by an Irish player. 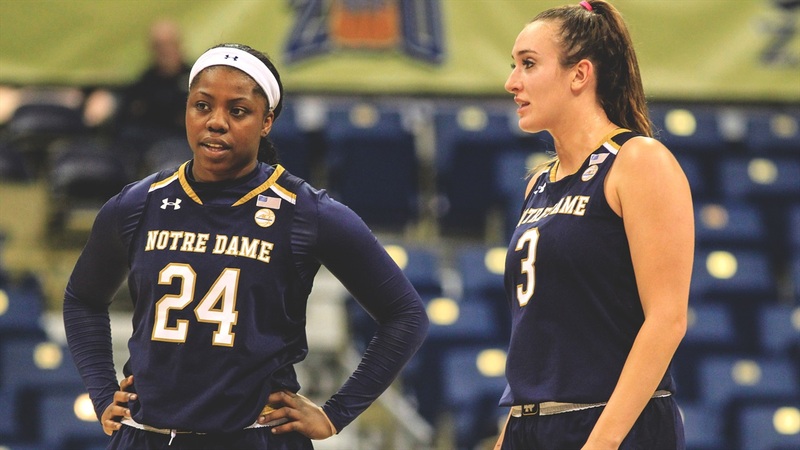 Notre Dame’s two incoming recruits — Samantha Brunelle and Anaya Peoples — were both named McDonald’s All Americans this past week. Brunelle — considered one of the top recruits in the nation — is a versatile 6’2” forward from Virginia. She’s won three international gold medals playing for various USA squads. Peoples won gold with the U18 USA team this past year. The 5’10” guard from Illinois can play point or shooting guard. As it stands today, the Irish will have just nine scholarship players on next season’s roster. The squad will have one senior (Jackie Young), two juniors (Dani Patterson and Mikki Vaughn), four sophomores (Jordan Nixon, Danielle Cosgrove, Abby Prohaska, and Katlyn Gilbert), and the two incoming freshmen. Vaughn and Gilbert are both eligible for another year due to injuries. Six of the nine were named McDonald’s All Americans — Young, Patterson, Nixon, Gilbert, Brunelle and Peoples. It will be interesting to see if the Irish can lure a graduate transfer or two to add depth and experience to next season’s team. A few additional items from the Tennessee game: Notre Dame committed 13 turnovers for the game — 7 in the first half. The Irish only turned the ball over twice in the third quarter and twice in the fourth quarter before two late giveaways by the reserves in the final minute. While the Irish were protecting the ball better in the second half, the Lady Vols committed 7 of their 11 turnovers for the game in the third quarter. The Irish took advantage to score 12 of their 24 third quarter points off those turnovers. The Irish shot an anemic 64.3% from the free throw line — 18 for 28 for the game. However, they did make 8 of 9 in the fourth quarter. Jackie Young was 4 for 4, Arike made 2 of 3 and Abby Prohaska made both of her two tries. For the season, Prohaska has made 18 of 20 from the line (90%). Notre Dame has made 337 free throws for the season — 84 more than their opponents have attempted and 159 more than the other teams have made — an advantage of 8 made free throws per game. ND’s 337 made free throws is tops in the nation. The Irish have held 12 of their 20 opponents over 10 points below their season scoring average. The 62 points scored by Tennessee was 16.4 points below their season average of 78.4. This extends the ND streak of holding teams to more than ten points below their season average to seven straight. Tennessee had averaged making 6.2 three-pointers per game. They only made 2 vs. the Irish. The Irish have held 15 of their opponents to fewer threes than they average per game.